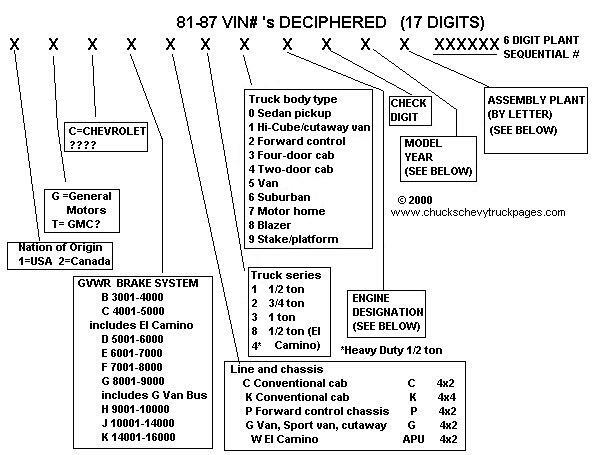 From 1981 - 1987 Chevy Trucks used a 17 digit VIN#. If your 1973 - 1987 body style has a VIN# located on the dashboard, with 17 digits, then it is between 1981 and 1987 model. If your truck has the VIN# on the dash, but it is not 17 digits, then it is a 1979, 1980, or 1981 model. From 1973 - 1978 Chevy Trucks had the VIN# on a plate, mounted to the driver's door jamb. Your VIN# can also be found on the factory options decal, located in the glove box. The decal lists all the RPO's (Regular Production Options) your truck came from the factory equipped with. If your 6th digit is a 4, then your truck is a "Heavy Half", also known as a "Big 10". >A well kept secret...............For Automotive Literature it is hard to beat E Bay! GM Factory Service Manuals include full detailed instructions for replacing body panels. Every nut bolt and screw location, torque specs, and a ton more. These books are 2" thick, and often include full wiring diagrams too! Get over to E Bay! E Bay Motors - I have gotten many manuals there. Most recently, I picked up a GM 1982 Light Duty Truck Factory Service Manual, which includes a full wiring diagram. I won the bid for $17.00. Back in 1992, at a local swap meet, I paid $30 for the same GM factory Service manual for my 77. The older manuals didn't include wiring. I currently have a bid in myself on a 1977 GM Factory Wiring Manual. The bid is currently $10. I just also won a bid on a 1977 GM Dealer Album. It includes all pricing for all 1977 Chevrolet vehicles, the cost of all options, all the separate optional equipment catalogs (and believe me there are lots) even a brochure for the Blazer Chalet. There are paint chips, and fabric samples. It is jam packed with info. Forget Chilton's, forget Haynes, what you really need, is the GM Factory Service Manual for your GM vehicle. You can also find truck parts as well. GM Light Duty Truck Service Manuals cover the following models: C/10, C/20, C/30, K/10, K/20, K/30, P/10, P/20, P/30. (C= 2wd pickups, cab n' chassis, and Blazer / Suburban, K= 4wd pickups, cab n' chassis, and Blazer / Suburban, and the P model line is Chevy Vans. GM considers anything 1 ton or under to be a "Light Duty" vehicle. So if you plan on restoring a car or truck, get your hands on a factory service manual, you will not be disappointed! These are the REAL books you NEED and eBay has them.